You can collect current market prices and store this information with your Quicken 2012 accounts (both tax-deferred and taxable). To automatically update security prices, just display the Investing tab and click the Portfolio button. Then, when Quicken displays the Portfolio tab, click the Update button and choose the One Step Update command. Quicken will grab nearly current security prices from the Quicken.com website. To manually update the market price for a security, you also need to display the Portfolio view of the Investing tab. But once you’ve done that, just use the arrow keys or click the mouse to select the security. Then move the cursor to the Quote/Price text box and enter the current price. 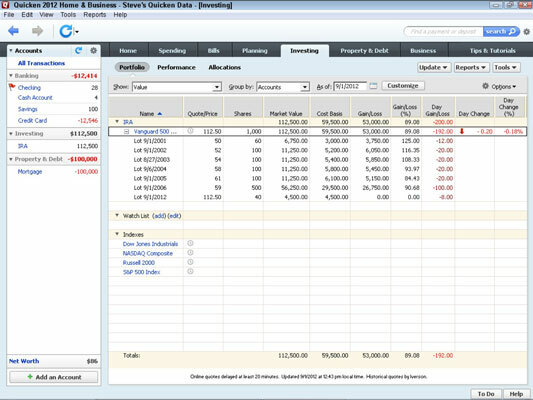 Using either the automatic or manual updating of pricing information, Quicken recalculates the Market Value field on the Portfolio tab as well as the Market Value figure at the bottom of the register window.